From Fiji to Rwanda, prayers and signs of commitment are being offered for the annual International Day of Prayer for Peace on 21 September. 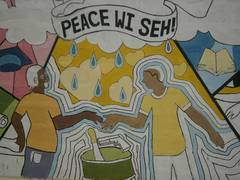 This year’s observances are taking place in parishes and on Facebook, led by people who attended a World Council of Churches peace convocation in Jamaica this May. “Use me, Lord, to build bridges of hope,” is the Rev. Edelberto Valdés Fleites’s prayer in Cuba. "Make us artisans of peace in the example of Christ, women and men of courage and discernment. Rather than fleeing from conflict, make us willing to identify, to denounce and to dare to become mediators for peace and justice,” asks Father Bernard Ugeux, a missionary in Rwanda. Noting the military drones appearing in local skies, a prayer from Wales begins: “Mewn byd lle mae mwy a mwy o sylw'n cael ei roi i ryfe” which translates, “In a world where increased attention is being given to war, in a country where there is an increase in military activity…it’s essential that the people of Wales continue to work for peace and reconciliation”. The Fellowship of Reconciliation there will open a large, handcrafted book for signatures on the International Day of Peace to testify that many wish to see a world of peace rather than war. 21 September is also the United Nations International Day of Peace. Elsewhere in the UK, Stefan Gillies’ peace day prayer is for a man in prison, naval medic Michael Lyons. Lyons is a conscientious objector in detention for refusing to deploy to Afghanistan. Churches Together in Britain and Ireland are publicizing his case. “Father God, we ask your peace to prevail amongst countries where there is no peace,” Shina Chileshe writes from Zambia. “The [Jamaica] convocation has helped me to see how I can contribute to peace in the community,” Wessley Manasa of Fiji says. He has organized two new youth groups since returning home. “The Palestinian Coalition of Christian Organizations, with Palestinian Moslem brothers and internationals, is celebrating this day at the YMCA Shepherds' Field in Beit Sahour with much commitment and dedication to work for peace and human dignity,“ writes Nidal Abuzuluf, in Palestine. Ten theological schools in Boston that sent students to the Jamaica meeting are promoting the peace prayer day in the USA. The National Council of Churches in India is staging a public event with local peace activists and movements, using the statement from the International Ecumenical Peace Convocation in May. “Often the victims of violence are ... the poor and the disenfranchised, the marginalized of society, women and children, even the unborn. ... We pray for empowerment for a peace that is just and right, that we may thus exalt and honour our Saviour and Lord, Jesus Christ, the Prince of Peace,” says a prayer by the Rev. Dr Tony Richie, bishop in the Church of God (Cleveland, Tennessee, USA). “You, God, bring peace; we know that security does not bring peace,” the Rev. Esther Suter writes from Switzerland.